Weekly Specials, Upcoming Classes, & MORE! 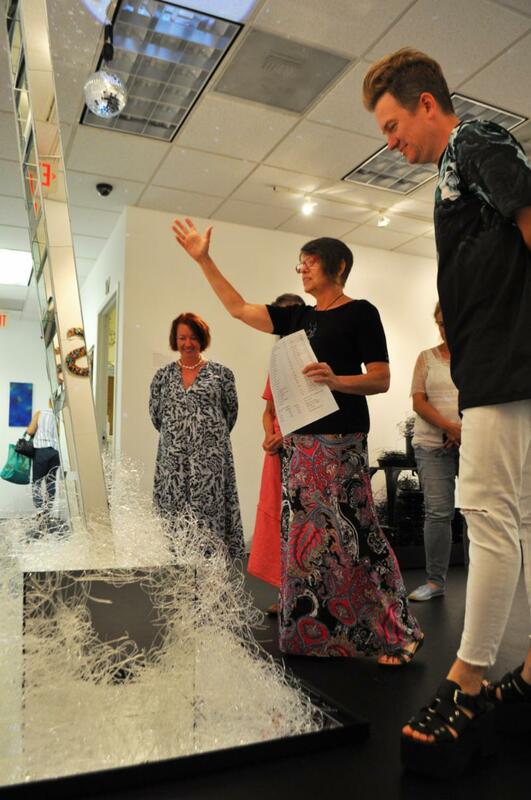 Thank you to all who joined us opening night at "Experimental". It was so great to see so many friendly faces and it was a fun evening of art and conversation. The exhibit is open at Artist and Makers, Tuesdays-Saturdays, 10-4 each day through September 26. There are 50 artworks on display spread throughout three galleries. Join Nancy as she takes you through the gallery and talks about her history of art making as well as answer questions about the ideas, methods and techniques used in creating such a diverse body of work. Each tour will last approximately 30 minutes. There is no charge for the tours but an RSVP is required. Please call the store to register . 5 lb jars of Bullseye Frits and Powders! 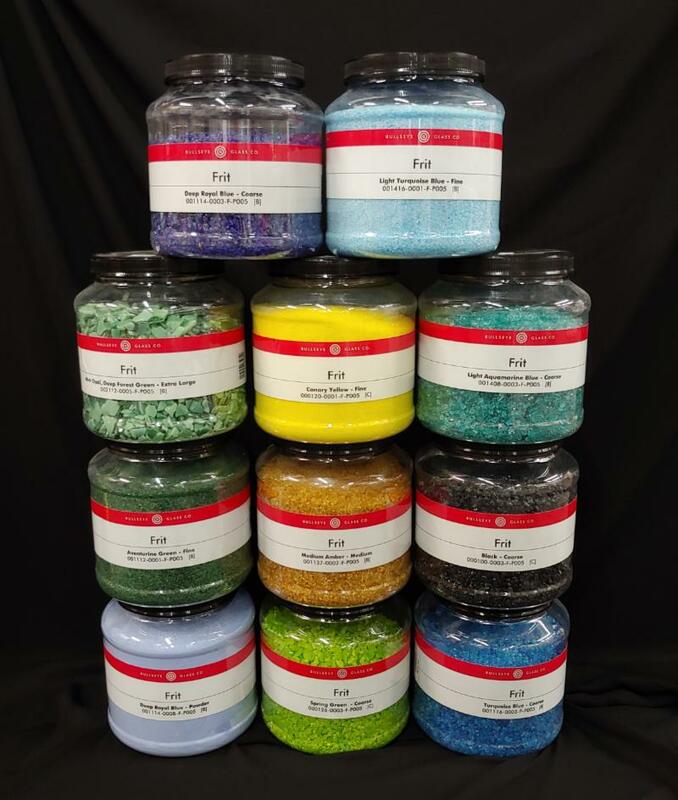 Save on the colors you use the most by buying in bulk! Already a savings on the per-pound price versus buying smaller jars, add the Weekly Special discount and SAVE BIG! IF WE DON'T HAVE IT HERE, WE'LL EVEN ORDER IT FOR YOU AT THE SALE PRICE!! A staple for any stained glass studio, save on ALL VARIETIES of stock patina this week! 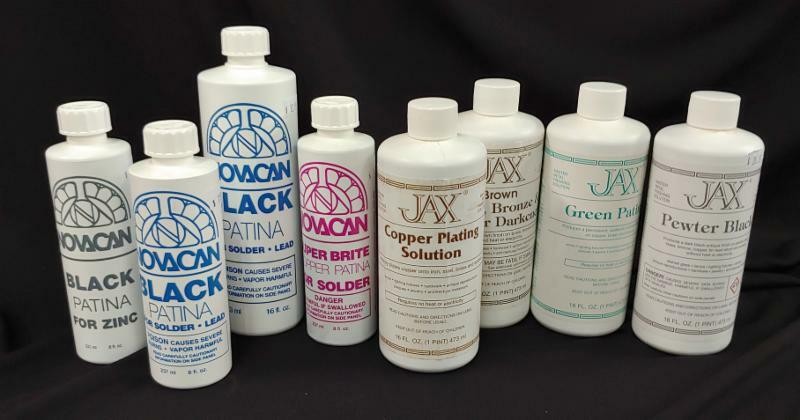 Includes Jax and Novacan brands, all finishes, styles, and sizes. NEXT WEEK IN WEISSER STUDIO! 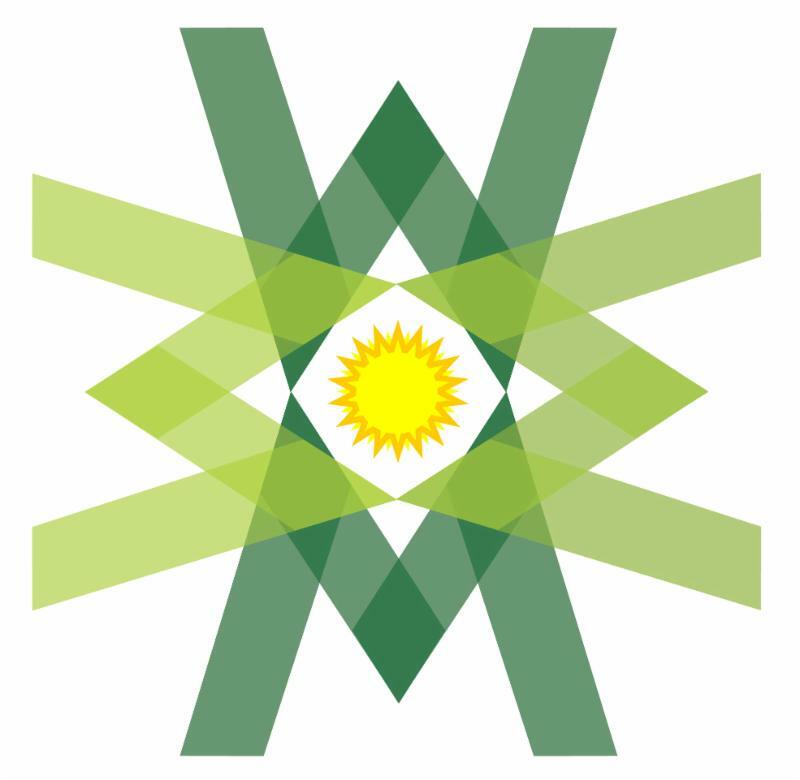 3-day workshop. Tuition $495.00. Includes glass, materials and use of tools. 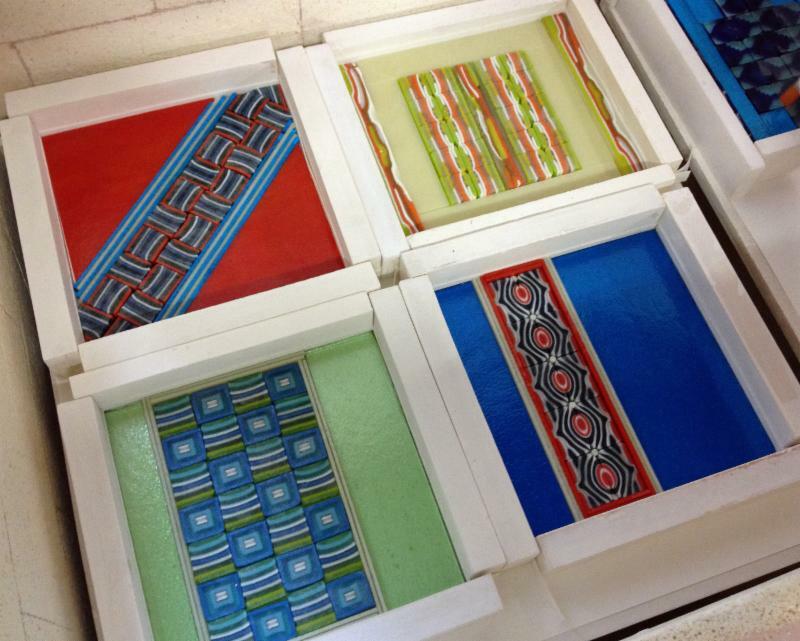 Pattern bar making is a fundamental skill for fusers and a fun way to create interesting patterns in fused glass. We will explore various methods for creating bars from simple to more complex. Explore planning your designs, methods of stacking, damming, molding and thinking outside the box for advanced and unique variations. You will also learn how to cut the bars and learn ways to construct and design with pattern bar slices. 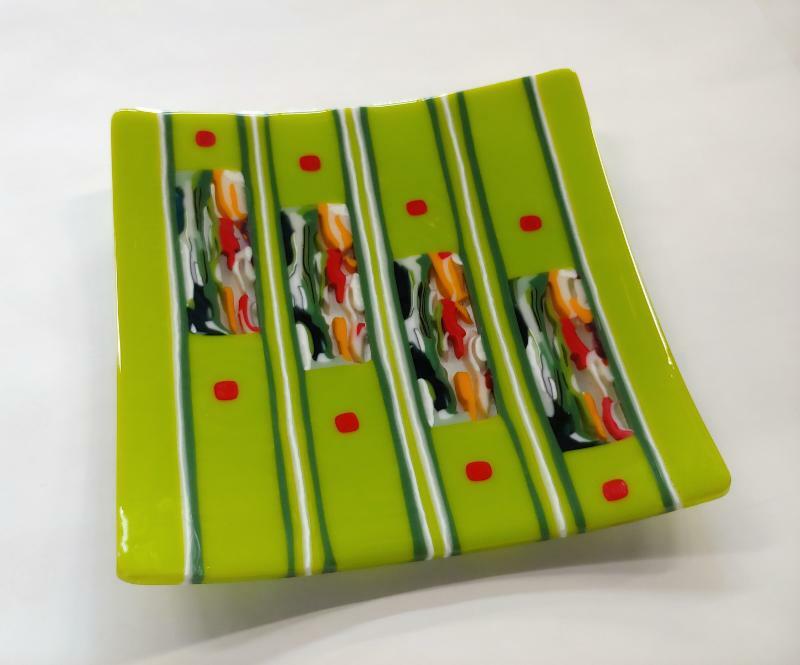 This class is great for both the first-time pattern bar maker as well as the student that would like to explore more pattern bar making options. After creating various styles of pattern bars students will learn how to cut, construct, fire and finish work made completely of pattern slices as well as using pieces as elements in combination with other methods. Each student will create at least one completed artwork as well as have a stack of parts to take home. Firing, cold working and finishing are covered as well. Join us for our three skill-building workshops, all focused on strengthening basic cutting principles common to all forms of glass art. The hardest thing for many people is the cutting of glass efficiently and effectively, and we'll teach you do it properly, whatever your glass medium. Sign up for one, two, or all three! 2½-hour workshop. Tuition $89.00. Appropriate for all levels! 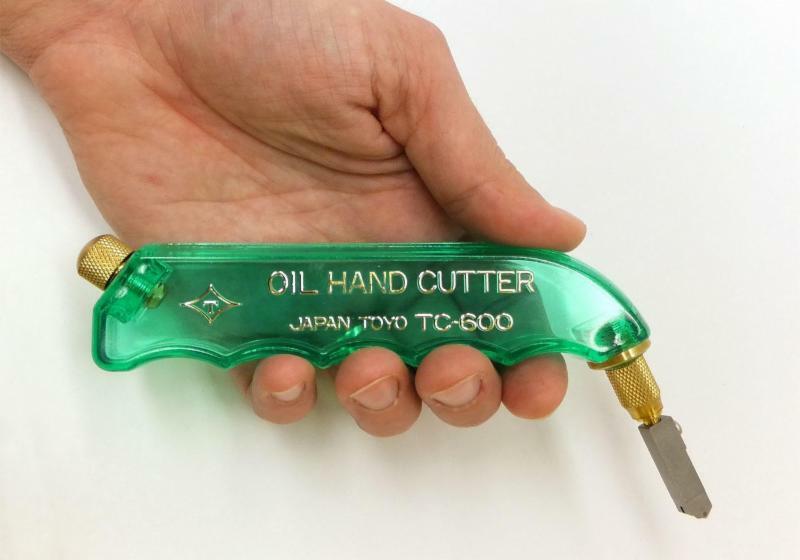 The key to success in any of the glass art forms is good cutting, and we’ll teach you to do it well! This comprehensive cutting lesson will cover both simple and more difficult shapes. Learn to cut with ease and confidence; guaranteed to improve your cutting no matter your skill level. An excellent starter class for students with no cutting experience, and a valuable refresher for the more experienced glass artist. Bring any challenges you may have! Straight lines, strips, geometric shapes and more- we teach you our studio methods of creating quick and accurate cuts saving you time and money! 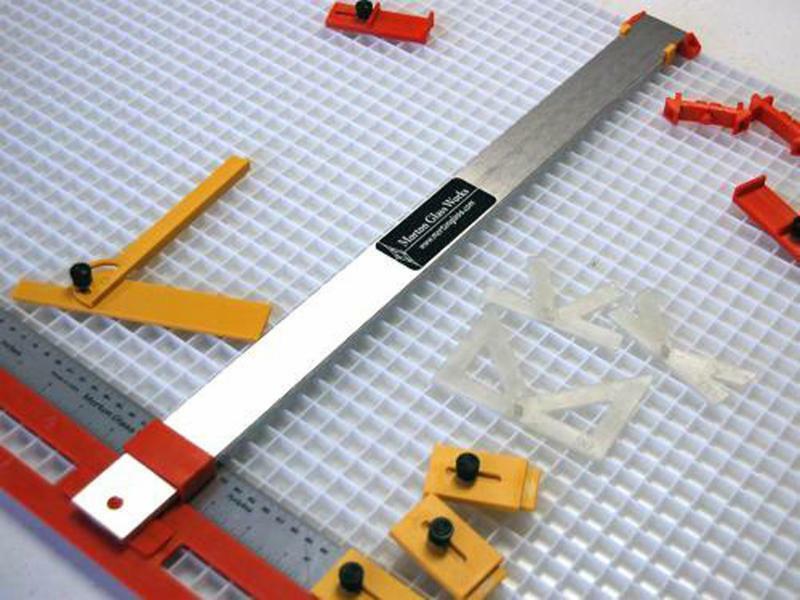 Starting with the Morton Portable Glass Shop, learn to master this extremely useful studio tool for strip cutting and creating quick and accurate geometric pieces of glass like squares, rectangles, diamonds and more. We will also show you strip cutting methods, and the specialty tools designed to help you succeed every time. also learn a variety of ways to create holes and openings in glass with tools like a Dremel, a drill press, and Ringsaw. 3-hour workshop. Tuition $99.00; includes supplies and frame. 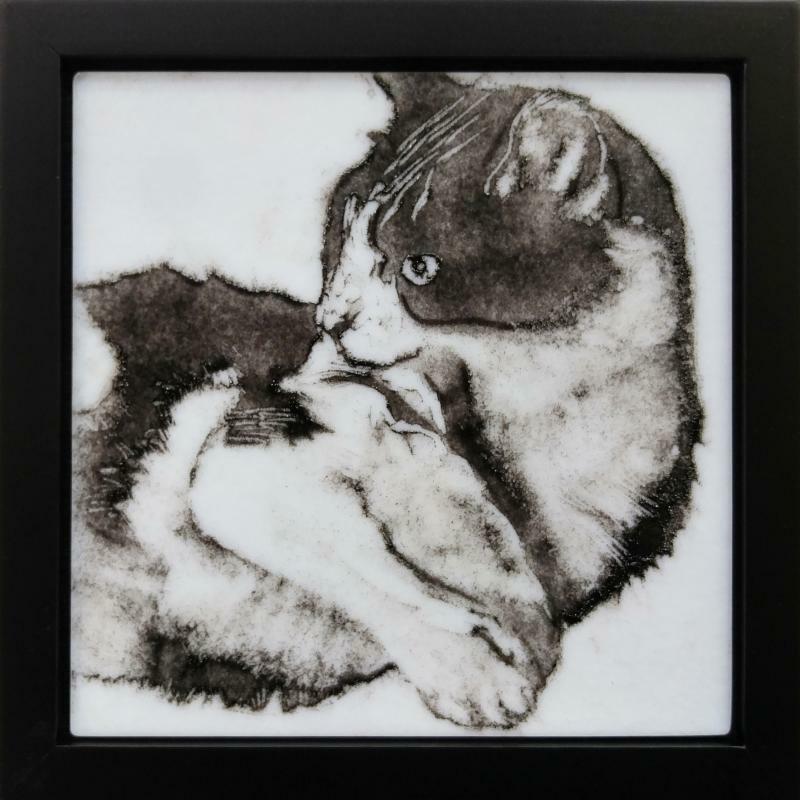 Create a black and white portrait of a favorite pet or other animal using fusible glass powder! 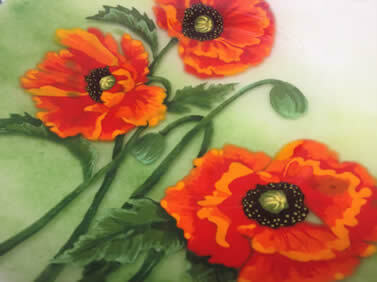 A great introduction to drawing with powders (have no fear- we will teach you! ), these creations also make amazing gifts for the animal lover in your life. Drawing experience is not required: we will give you tips, guidelines and techniques to assist you in creating realistic portraits. 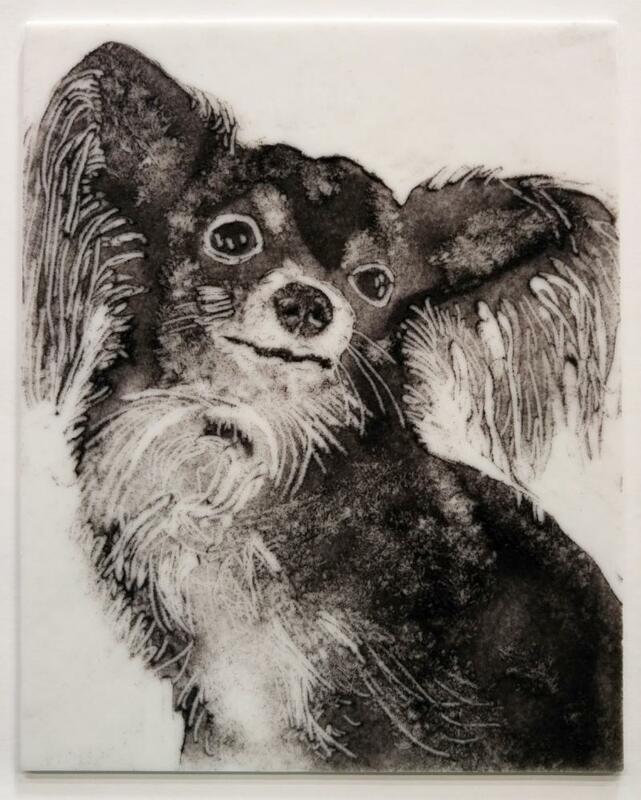 No previous glass experience is required, and all you need to bring is an 8”x8” black and white photo of your favorite pet! We will send you guidelines prior to class. Just look at what some of our students have created in previous sessions! 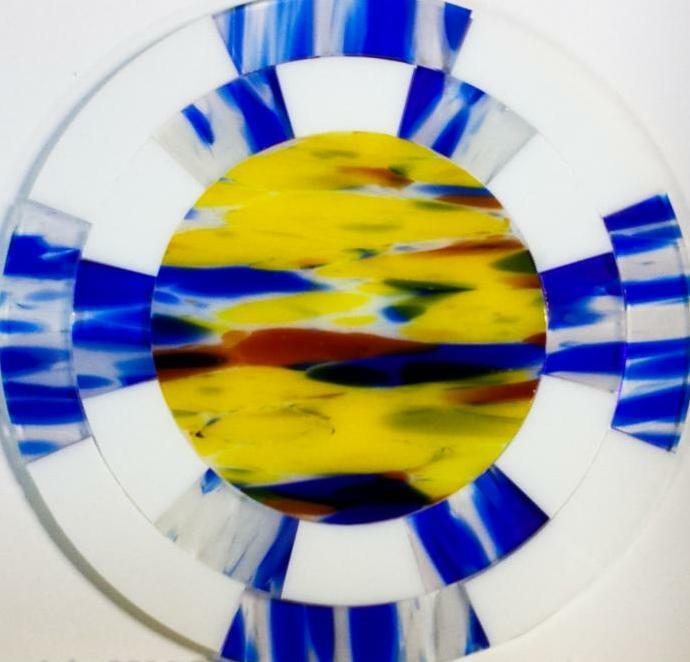 See details on these and all our other courses on our website, weisserglass.com! All classes require pre-registration; call the shop at 301-571-8966 if you'd like to sign up. Colors for Earth Paints, Color Concentrates, and Kits! As seen in Mark Hufford's latest round of classes here in Weisser Studio, fresh stock just in for all your painting projects! Huge variety of colors and products. Also back in stock, all three varieties of Color Concentrate kits. ALSO IN- High-Quality, Genuine Sable Liner Brushes! Treat yourself to the ultimate luxury in painting tools; the sable brush! The finest sable is used to create these brushes, giving you ultimate control and precision in line and stroke, at an amazing price. A must for anyone looking for the advantage of the highest quality tools! 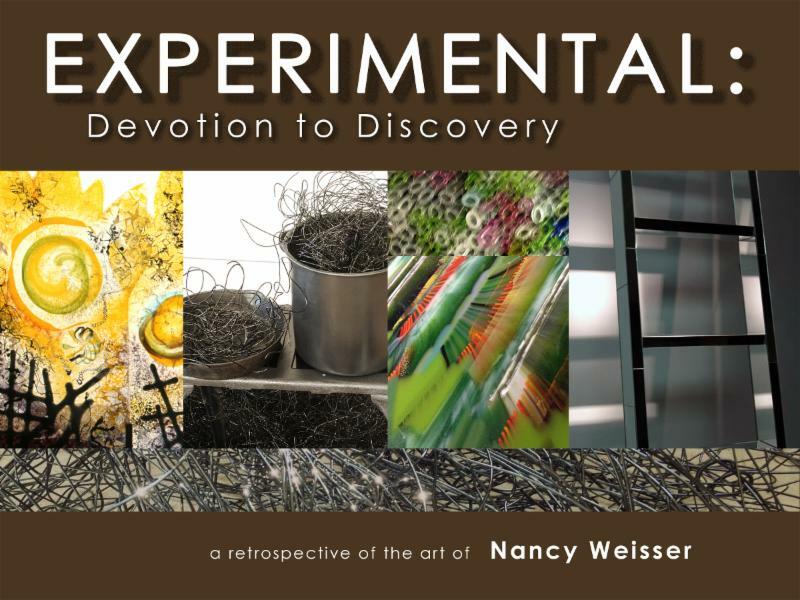 NANCY WEISSER SOLO RETROSPECTIVE EXHIBIT AT ARTISTS & MAKERS! 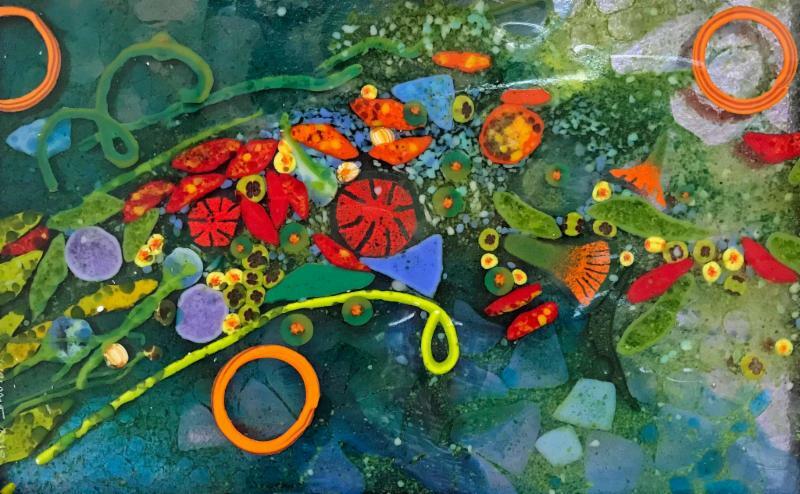 Nancy Weisser’s exhibition is a solo retrospective that takes a look into her lifelong career, including 40-plus years in the art glass field and covers several themes- installations, new works, and work on paper and canvas. ONLINE LEARNING WITH NANCY WEISSER! ﻿If you haven't been able to take Nancy's Dream Garden Master Class in person, now you can learn her methods online! Learn from Nancy anytime, 24/7! CLICK HERE TO PURCHASE THE VIDEO CLASS!